Take action! Make yourself heard! In order to save face and retain his “pro-life” credentials, Sen. Greg Treat has proposed a new pro-life anti-Abolition bill: Senate Bill 195. SB195 is a so-called “trigger bill” which states that in the event that Roe v Wade is overturned, Oklahoma will THEN abolish abortion. SB195 is a poor substitute for SB13 in that it will never go into effect until after some state passes a bill like SB13 and the Supreme Court upholds it as constitutional. This bill is designed to be a substitute for doing whats right. 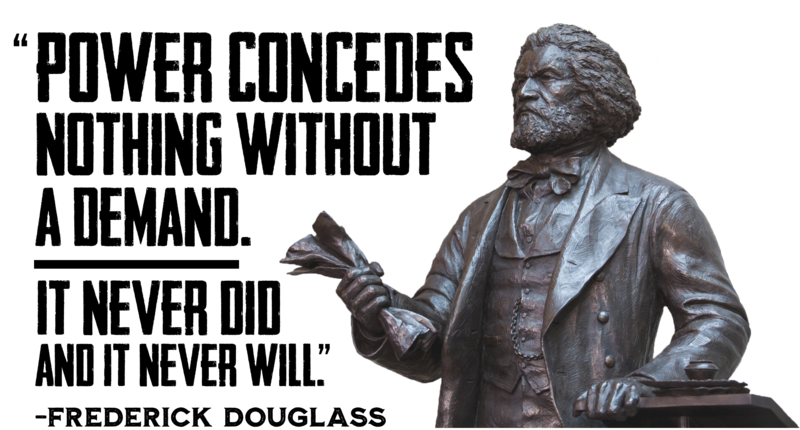 It is designed to delay abolition. Thousands and Thousands of babies will be murdered because of Treat’s decision to back SB195 instead of SB13. Treat is rejecting the opportunity to be a William Wilberforce for preborn babies in Oklahoma. He is determined to oppose abolition and to continue playing pro-life politics as usual. 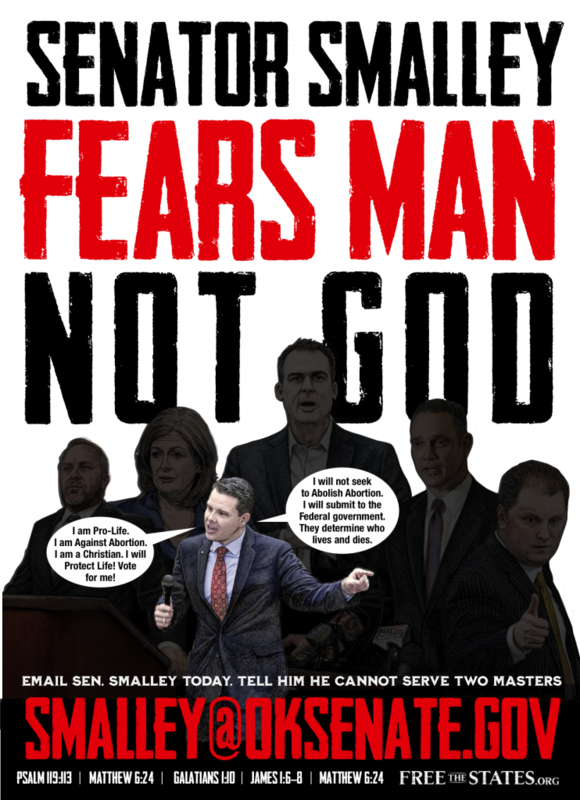 Senator Jason Smalley is a pro-life politician who believes that murdering babies in the womb is a “constitutional right” and that it should NOT be challenged. We disagree! The Roe v. Wade ruling was NOT constitutional and the right to murder babies in the womb should be challenged, not obeyed and defended. At this time, Jason Smalley is the man most responsible for keeping abortion legal in our state. He is one of the state’s leading anti-abolitionists.5,000 butchered babies in 2020 will be his legacy. This does not have to be the case. Smalley could support #SB13 and become a William Wilberforce for the preborn instead. If abortion is ever to be abolished, the Jason Smalley’s of the world must repent of their subservience to the supreme Court. Send the Subject Line “SB13 is Constitutional. Roe v. Wade is not” to the whole Senate. Copy these email addresses and place them in your bcc box. Copy and paste all of these email addresses into your bcc address box when you compose your emails. Send current emails to Greg Treat and Jason Smalley at Smalley@OKSenate.gov and bcc the rest of the legislature. Given the choice of a controversial bill to criminalize abortion, or a non-controversial, do-nothing pro-life bill, legislators tend to choose the Pink Puff and Piffle. Essentially, they trade meaningless victories for votes, and while the game goes on, abortion stays legal and the slaughter of innocent children continues. This is why the Pink Puff and Piffle of the pro-life movement is often the enemy of what is needed and necessary. Problems: The bill includes the legal loophole of the word “knowingly,” and it is completely unenforceable. It implicitly condones state-sanctioned murder and discriminates by not providing equal protection of the law to thousands of other preborn humans. Problem: This would do nothing more than shame abortion providers for not murdering babies in perfect compliance with state law. Problems: The “Act” enacts nothing. It simply repeats concepts already occurring in the Oklahoma Constitution and statutes. It is completely symbolic and will likely become a hiding place for “pro-life” politicians too scared to support SB13. Problems: It implicitly condones state-sanctioned murder. 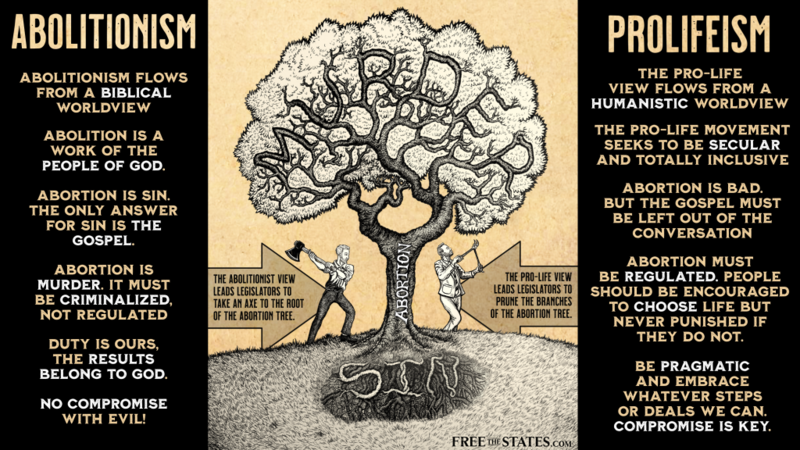 It expends funds telling people that abortion is bad, rather than in direct defense of innocent preborn humans, which would be the proper function of state government. Problems: This bill alone does not establish justice, since revoking a license is not an adequate response to murder. Also, can we reasonably argue that licenses should be revoked for performing legal, state-sanctioned and state-regulated medical procedures? This proposal will not work without SB13. The reason that all of the above bills fall short of establishing justice and fail to abolish abortion is because they are rooted in a secular humanistic pro-life ideology and not a biblical abolitionist ideology. Study this graphic below to understand the primary differences between an Abolitionist and Pro-Life view, and how these differences affect legislation. Tell them to support SB13 and that all of the other anti-abortion bills do not cut it. Copy and paste all of these email addresses into your bcc address box when you compose your emails. Send current emails to Jason Smalley at Smalley@OKSenate.gov and bcc the rest of the legislature. For the next few days PLEASE call and email the leader of the Senate Greg Treat every day! 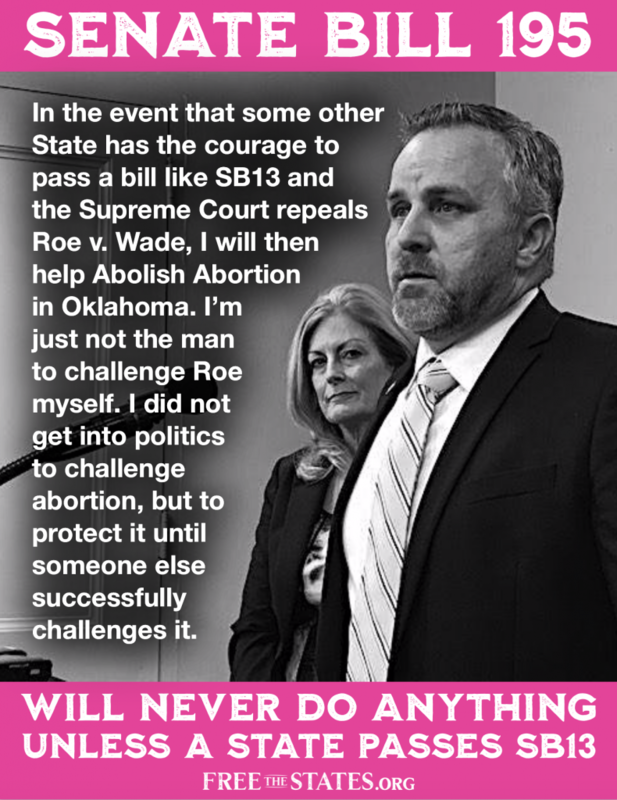 (405-521-5632; treat@oksenate.gov) He has the power to help abolish abortion in Oklahoma or to ignore SB13 and keep it legal. Let Greg Treat know that you understand the legislative process and the power he possess to help or kill bills. Ask Greg Treat to be a William Wilberforce for the campaign to abolish abortion in Oklahoma! If Treat wants the bill to pass, it will likely pass. If Treat wants Abortion to remain legal, he will make sure that SB13 never goes to a vote and gets stuck in committee. This is a game that compromised politicians play with their supporters. 3) One of those committees is inappropriate and possibly a means to bury the bill so he does not have to stand up for justice and lead the senate to protect the right to life. Again, Treat could get behind SB13 and even co-sponsor the bill himself. Let him know that a future excuse that his “hands were tied” and that the bill just didn’t make it through the process is a wicked lie. Treat can be a champion for abolition (like William Wilberforce was in Britain during the campaign to abolish the slave trade) or he can go down in history as the man who kept abortion legal in Oklahoma. Treat has a majority of “pro-lifers” in the senate who have all told their supporters that they oppose abortion. Here is his chance. Let Treat know that you are watching, that you vote, and that you will not support any “pro-life” politician in the future who does not support the Abolition of Abortion in Oklahoma Act. -Governor Kevin Stitt. He can use his executive power to make it very difficult for any other bills to pass until SB13 is on his desk to sign. Urge him to get the career politicians in check on the issue of life and demand that they get SB13 on his desk to sign immediately. Over the next few days PLEASE call and email ALL of these legislators! They have the power to help abolish abortion in Oklahoma or to ignore SB13 and keep it legal. Remind them that there is no other bill more important than SB13 and the excuse that they ‘just couldn’t get to it this session,” won’t fly. Tell them to hear and vote for Senate Bill 13! Tell them that that the blood of innocent children will be on their hands and that you will do everything in your power to make sure they are known as Anti-Abolitionists and fail to regain their seats in the legislature if they do not pass SB13 out of committee and hear it on the floor.